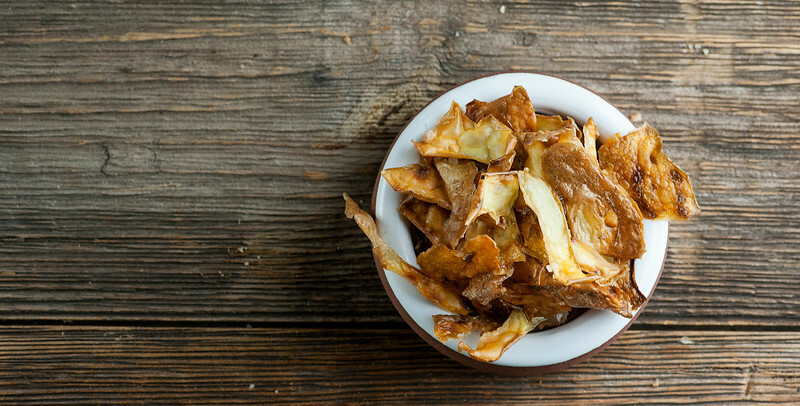 Once you make this super easy recipe for potato peel chips you will never toss those peelings out again! Bet you can’t eat just one of these babies. 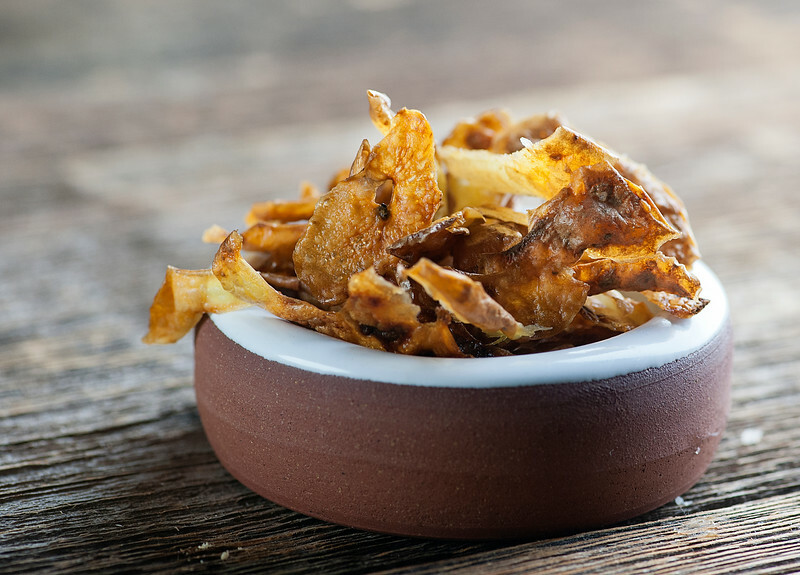 When I think about this recipe for potato peel chips, I have to close my eyes and NOT think about the giant towering mountain of potato peelings in my life that went into the garbage, the compost pile and other places other than into this utterly simple, totally addictive nibble. Because yes, this involves taking the peelings from whatever delectable mashed potato recipe you are making, tossing them with a little olive oil and salt, and baking them until they are delicate, crispy little potato chips. And in this case, chips made out of the peelings, where lots of the fiber and nutrients live. Could this be any better? Am I the last person on the planet to figure this out? I have SO much catching up to do! This recipe works best when you have a bunch of potatoes being peeled up for something (hello, Thanksgiving mashed potatoes!) because the potato peelings are so thin and delicate. That teeny little bowl in the picture is from two potatoes, and let’s just say it was an aggressively friendly little battle in my kitchen that day to see who got the most chips, because there were not many to go around. Regardless of how many potatoes you are peeling, go ahead and make them though, because a teeny bowl of potato peel chips is infinitely better than no chips at all. Besides, if you are like me, once you make your first batch it will be impossible for you to throw potato peels out Ever Again. It gives a whole new meaning to the word recycling, right? Pinch of sea salt (and you can shake on some black pepper too, if you like! Preheat oven to 425. Line a rimmed baking sheet with parchment paper or non-stick foil. Gently toss the peelings with the olive oil. Place in a single layer on the baking sheet, and sprinkle with salt. Bake for about 15 to 20 minutes or so, watching carefully through the door to make sure they don’t get too brown. Remove when they are crispy and serve at once. Can be increased to as many potatoes as you can peel! This is such a great idea!! I’d eat a whole batch. Yep, that’s pretty much what I do, unless my husband beats me to it! You saved my potato peelings! I mean, I was a few days away from tossing a ton in the garbage. Now that’s not gonna happen. These are brilliant! You are about to have a ton of delicious homemade chips, Mir! Hurray! OMG, how amazingly clever!!! I actually prefer just the skins of potatoes, because I’m weird, so these potato peel chips are like heaven to me! I would eat the raw potato skins as my mom was peeling potatoes when I was little :) These sound infinitely better! I bet these are dangerous though, because they look just beyond delicious! Pinned! Cheers, Kate! Kate, this is SUCH a great idea! I love how you can get two uses out of potatoes. These chips looks delicious. I think I would devour these in no time! i know exactly what you mean–i’ve been discarding potentially delicious items for YEARS! this batch looks wonderful. Oh my gosh, What a fantastic idea! Im trying this next time I make mashed potatoes! It’s my new favorite kitchen trick! Can you make these and out them in a container overnight ? In the fridge or cupboard ? I wish I could say yes, but honestly they are best eating right away – they tend to lose their crispiness overnight. Making some right now! I peeled some nice Yukon gold potatoes to have with some New Years sauerkraut later. I drizzled mine with some olive oil, garlic salt and black pepper! Can’t wait to try them! Sounds like the perfect New Year’s Eve snack, Brooke! Made these tonight, and they were addictive and delicious. Will definitely be making again! Hi Shiraz! I wish I could tell you, but at this time I’m not set up to list food values like fat and calories. I will keep that in mind for the future though! Hurray! Glad you liked them.